The Home Office might be the money-making business space for your family or it might serve as the command central for organizing family activities, appointments and events, as well as paying bills and filing claims. Despite how important this room in your home can be, keeping it well maintained and organized can sometimes slip down the priorities list – until your home office has reached a point of total chaos, with piles and piles of papers everywhere. Well, would you like to gain control of all those piles of papers in your home office? Captured Clutter…organizing therapy, LLC, has a simple plan for getting your home office organized. The goal is to help you become more productive and efficient. To make this process less stressful, we implement the following customized steps to ease you into your new system. We discuss and outline your personal office needs. We examine your schedule, desk, shelving, drawers, cubicles, offices supply closet and floor space. We review your current papers, bills, claims, receipts, vital documents, investment records and insurance forms as they relate to your filing system. We designate a space for all your office equipment, supplies, books and filing needs. We draw a map of how your office will flow. We sort through all your correspondence, supplies and books. We delete, toss and recycle the non-essentials. We figure out a logical filing system that will work for your learning style. We identify products that can be repurposed or that are needed to contain your newly designed office space. We enable you to take control of your office space. We give you guidelines to keep you on task, on track and on time. We empower you with the knowledge that your newly organized office will make it easy for you to find things when you need them. 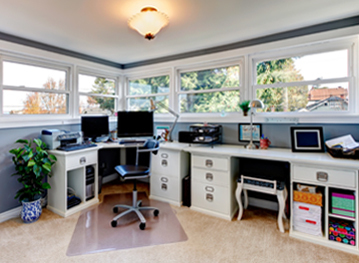 Are you ready to get your home office organized and under control? Call (678) 294-7813 today to learn how you can get started.